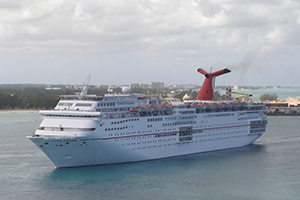 Carnival Cruise Line is an international cruise line with headquarters in Doral, Florida. Its logo is the funnel-like the funnels found on their ships, with red, white and blue colors. The funnels are ironically shaped like a whale's tail. 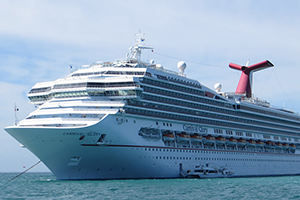 Currently, Carnival is the largest cruise line in the world, based on passengers carried annually, annual revenue, and total number of ships in fleet. Carnival is one of ten cruise line brands owned by the world's largest cruise ship operator, the American-British Carnival Corporation & plc. 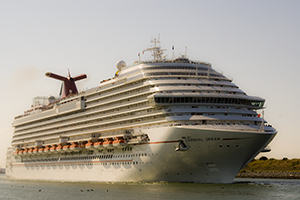 In 2018 Carnival Cruise Line was estimated to hold an 8.9% share of cruise industry revenue and 22.0% of passengers. 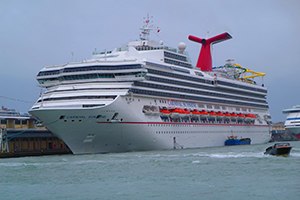 It has 26 vessels and is the largest fleet in the Carnival group. The ships fly flags of convenience; 18 of the ships fly the Panama flag, six of the Bahamas and two of Malta. Its headquarters are in Miami, Florida, the United States. The North American division of Carnival Corporation has executive control over the corporation and is headquartered in Doral, Florida. 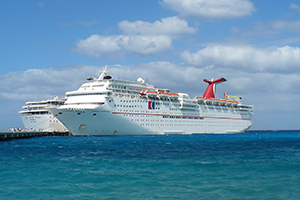 Carnival Cruise Line was founded in 1972 by Ted Arison. To finance the venture, Arison turned to his friend Meshulam Riklis, who owned Boston-based American International Travel Service (AITS). Arison and Riklis set up the new company as a subsidiary of AITS. AITS was to market and promote the new venture. In 1974, due to regulatory issues, Riklis sold AITS's interest in the company to Arison for $1, but subject to Arison taking over the substantial company debts. The split enabled Arison to enter into new relationships with independent travel agents. He also promoted his cruises to fun-loving younger people. The format was very successful financially. Until 1975, the line consisted of only one ship, the Mardi Gras. In 1975 another ship was acquired, the Carnivale. 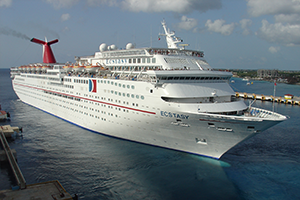 In 1996, Carnival Destiny of 101,000 GT became the largest passenger ship in the world at the time and first to exceed 100,000 tons. In 2001, Robert H. Dickinson, then President and CTC, participated in a BBC documentary, Back To The Floor. Dickinson went to work at the lowest crew levels on the MS Imagination in the Caribbean, where he shadowed a Romanian cleaner, Alina. 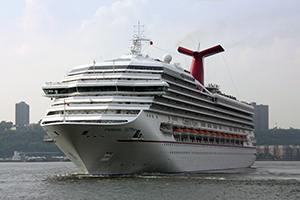 In 2004, Carnival Corporation ordered for a development program for Carnival's new ships, the Pinnacle Project, calling for a 200,000 GT prototype, which would have been the world's largest cruise ship at the time. The ship was canceled and after that, they came up with a project called Next Generation. 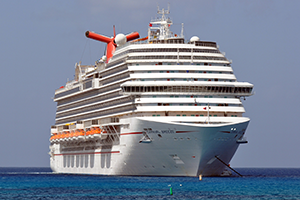 In 2009, Carnival released their biggest ship at the time, the Carnival Dream, a new 128,000 GT ship. 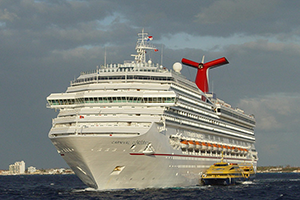 Carnival Dream entered service on 21 September 2009. After several voyages in the Mediterranean, she was set to offer weekly Caribbean cruises from Port Canaveral from 5 December 2009. 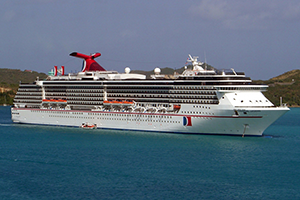 A sister ship, Carnival Magic, debuted on 1 May 2011. 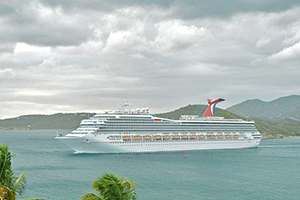 On 1 December 2009, it was announced that Carnival placed an order for a third Dream-class vessel. It entered service in June 2012 and its homeport is now Galveston. 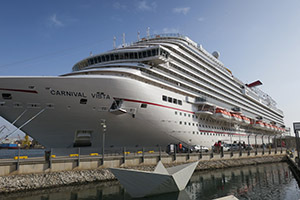 On May 10, 2010, Carnival selected a name for their new Dream-class vessel in 2012 - Carnival Breeze. On 26 October 2012, it was announced that Carnival had ordered a brand new 133,500 GT ship for their Carnival Cruise Line brand. This ship, built by Fincantieri, was the largest ship they have ever built. It sailed its maiden voyage on May 1, 2016. The new ship was named Carnival Vista. In January 2017, Michael Thamm was appointed CEO of Carnival Asia to oversee operations in China and the surrounding region. 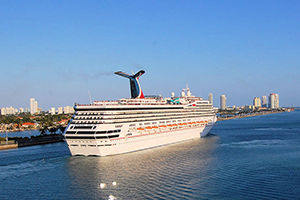 A sister to Carnival Vista, Carnival Horizon, joined the fleet with their inaugural voyages from Trieste, Italy and Barcelona, Spain on May 1, 2016 and April 2, 2018, respectively. Queen Latifah is the Godmother of Horizon for its christening in New York on May 23, 2018. 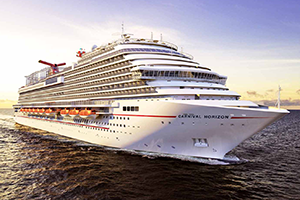 Carnival Panorama is set to join the fleet in December 2019. In February 2018, the company's officials unveiled a major port development project in Ensenada, Mexico. 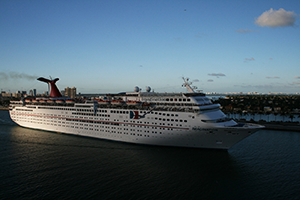 In 2016, Carnival extended their contract with Port Everglades cruise port to 2030. The port began a $54 million renovation in anticipation of the deal. The agreement brings in an estimated 4,780 local jobs and over $200 million in personal income. 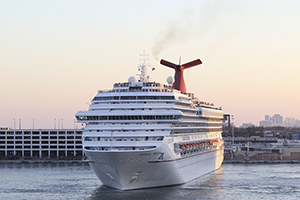 In 2018, Carnival brought the Carnival Fantasy to Mobile, Alabama. Economists anticipate an increase in tourism to Mobile and revenue at an estimated $35 million. The company has reportedly been paying wages under $1.50 per hour to employees with low-to-nonexistent benefits, such as holidays or minimal vacations. Monthly salaries of the high-paid workers are around $1,300. Employees report strenuous working conditions such as 14-hour shifts with no days off. Retirement benefits were revoked in October 2013. 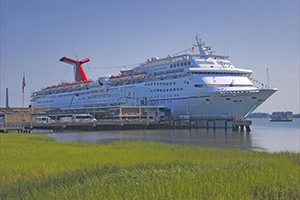 In the aftermath of Hurricane Katrina, three of the Carnival cruise ships were chartered by the United States government for six months to serve as temporary housing until the houses can be rebuilt. After being chartered for six months, their planned voyages were canceled, and passengers were refunded. 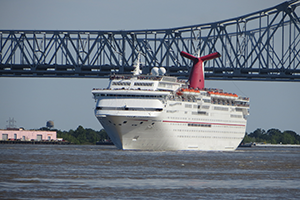 Holiday was originally docked in Mobile, Alabama, and later Pascagoula, Mississippi, and Ecstasy and Sensation were docked at New Orleans, Louisiana. The six-month contract cost $236 million. 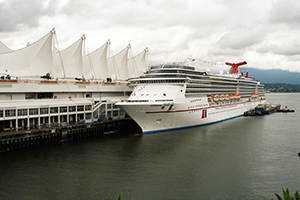 The contract was widely criticized because the vessels were never fully utilized, and Carnival received more money than it would have earned by using the ships in their normal rotation. Two more Destiny-class ships sail for Carnival's sister company Costa Cruises, Costa Fortuna and Costa Magica. 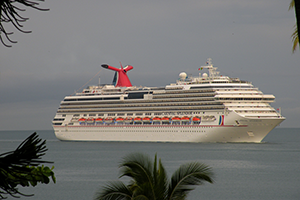 Carnival Triumph and Carnival Victory are Modified-Destiny-class cruise ship because they were built with two more decks than the rest of the Destiny-class ships. Two more Spirit-class ships sail for Carnival's sister company Costa Cruises, Costa Atlantica and Costa Mediterranea. One more Dream-class ship sails for Carnival's sister company Costa Cruises, Costa Diadema. Conquest-class is based on the overall design of the Destiny-class, but are longer. Because of the additional length, the Conquest class has expanded facilities compared to the Destiny class. Not all ships have a reservations-only restaurant. 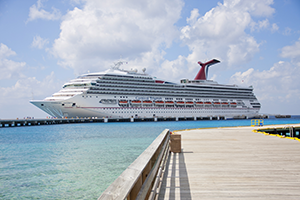 Carnival Conquest, Carnival Glory, Carnival Valor, Carnival Liberty and Carnival Freedom, slightly differ from the rest of the fleet because they have Carnival's Seaside Theater installed by the main pool on the lido deck. 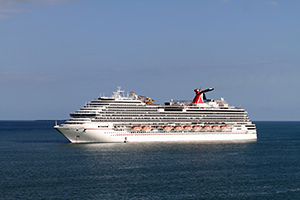 The Destiny-class ships, Carnival Destiny, Carnival Triumph and Carnival Victory also have one installed. 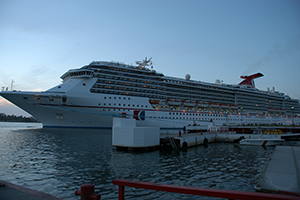 Carnival Splendor and the Dream-class ships, Carnival Dream, Carnival Magic' and Carnival Breeze were built with the Seaside Theater. 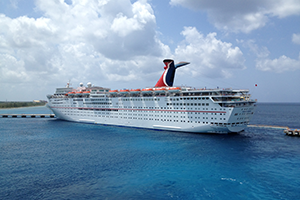 Carnival Splendor offers facilities other ships do not have. This is because the ship was originally designed and built for Carnival's sister company Costa Cruises. Costa Cruises had five sister ships to Carnival Splendor: Costa Concordia, Costa Serena, Costa Pacifica, Costa Favolosa and Costa Fascinosa, until the Costa Concordia was grounded and wrecked in January 2012. 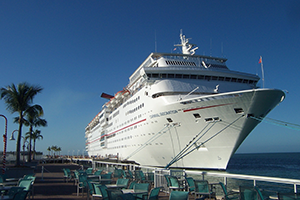 The inaugural voyage for Carnival Splendor was on 2 July 2008 from Genoa, Italy to Dover, England. Carnival Panorama. Delivery: 2019. Gross Tonnage: 135,500 GT. Sister to the Carnival Vista and Carnival Horizon. Originally planned to sail for P&O Cruises Australia. 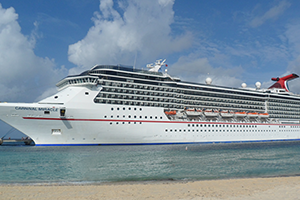 Carnival Panorama will sail from Long Beach CA doing 7 day Mexican Riviera cruises year round. TBA. Delivery: 2022. Gross Tonnage: 185,000 GT.